Blurb Description: Wilhelmina has a hundred enemies. SOMEBODY PLEASE EXPLAIN TO ME HOW I HAD THIS BOOK FOR MONTHS AND DID NOTHING WITH IT? I DON’T KNOW HOW TO EXPLAIN THIS BOOK, BECAUSE THERE ARE NO WORDS FOR IT. I just sped through it, not knowing what was happening around me and not processing any of the heart-breaking reveals in it because it was ALL TOO MUCH for one simple Book-Dragon to bear. I think I’ll still live in my happy little denial place because I NEED MORE and there isn’t any. If you have read The Orphan Queen, and haven’t read The Mirror King for some reason YET, then let me tell you THERE IS NO TIME BETTER THAN THE PRESENT, for this does not let you down! Jodi Meadows makes you fall – and I mean REALLY REALLY FALL – for all of her characters that you met in The Orphan Queen, more than you ever thought possible. 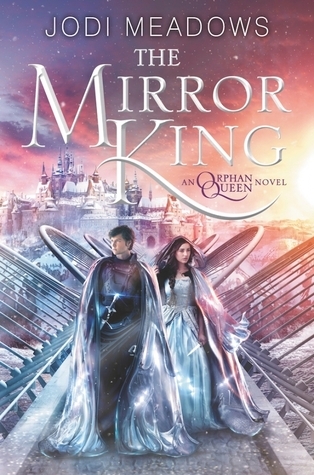 This book starts off exactly where The Orphan Queen left off, and I have no idea HOW I SURVIVED for so long. In the Inundated City of Skyvale, Prince Tobias has been shot. Wilhelmina has been exposed as the person she really is – Flasher, Imposter and a Queen with a pet wraith on her leash. The Ospreys are divided, Patrick Lien is out of control, claiming to carry out assassinations on Wilhelmina’s behalf but more importantly, the Wraith are coming, and they’re coming now. 1. The Multiple Identities: I ADORED HOW EVERYONE WAS ACTUALLY SOMEONE ELSE, AND SOMEONE WAS ALWAYS PRETENDING AND SOMEONE ELSE ALWAYS KNEW. It made it so intriguing, the game of keeping up pretenses and all the secrets within each pretense and I LOVED IT SO MUCH AHOIHAFOIDH. 2. The Plot: This was such a cool, VERY WELL EXECUTED plot with so many twists that even if you saw one coming, the next one was IMPOSSIBLE. I love that there was so much actual GOVERNING as much as the dances and the angst, because being a monarch means GOVERNING, okay? Also, the magic, the wraith and the Kingdoms AAAAAAH. 3. The Characters: THEY WERE ALL SO BEAUTIFUL, OKAY? Including the Wraith. And Tobias. And James. But especially Wil! Oh how I LOVE my flawed mistake causing babies, and there imperfect decision making and their passion and bravery. PERFECT. I love that there were so many secondary characters that were given importance! So that’s about it. If you haven’t read this book, it is SO WORTH IT! 5 GOLDEN STARS. HAVE YOU READ THIS SERIES? *Uses Cait (from Paper Fury's) book thumping method until you begin! 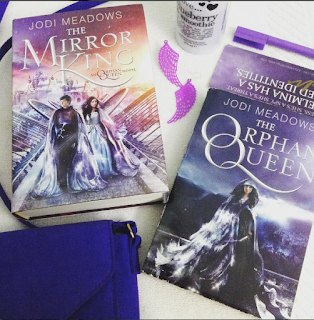 Have you read any more Jodi Meadows books? What is your favourite fantasy novel? Any recommendations for me?